The Beatles for Classical Piano (Phillip Keveren Series). By The Beatles. Arranged by Phillip Keveren. For Piano/Keyboard. Piano Solo Personality. Softcover. 64 pages. 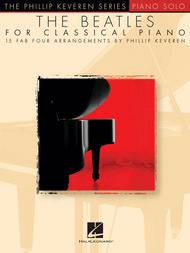 Published by Hal Leonard (HL.312189).ISBN 1458407632. 9x12 inches.15 unique arrangements of Fab Four favorites, including: All My Loving • Come Together • A Hard Day's Night • I Want to Hold Your Hand • Lady Madonna • The Long and Winding Road • Lucy in the Sky with Diamonds • Sgt. Pepper's Lonely Hearts Club Band • Ticket to Ride • When I'm Sixty-Four • While My Guitar Gently Weeps • and more.